Dampen a clean, soft, lint-free cloth or paper with water only. Wipe the screen. Do not spray liquid directly on the screen. Easy enough. BUT, if you find you're out of paper towels and don't want to splurge on a special lint-free cloth, coffee filters will do the trick, as well. 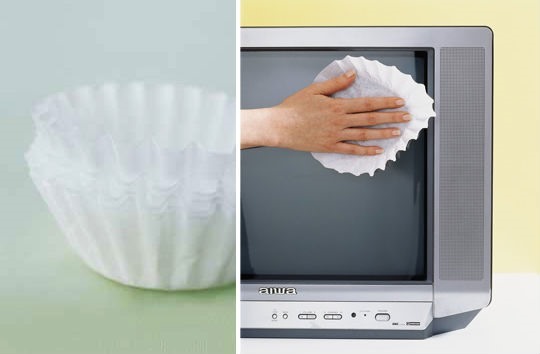 "It turns out that those little rippled cones of blotting paper that filter your morning brew are perfect for clearing the dust from your television screen or computer monitor. Now I will use coffee filters to wipe off coffee stains from my monitor.